Gianvitto Rossi is every woman's footwear label of choice. 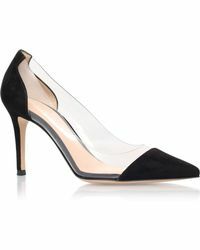 Famous and adored for his inimitable contemporary spin on classic styles and meticulous attention to expert craftsmanship, Rossi offers creations that provide elegant foot silhouettes. Feminine and sophisticated designs are produced in Rossi's own Milanese factory where exacting standards of manufacturing are followed, making his creations impeccable and incredibly comfortable. Add Gianvitto Rossi heels to your footwear collection and stand proud in true Italian style.